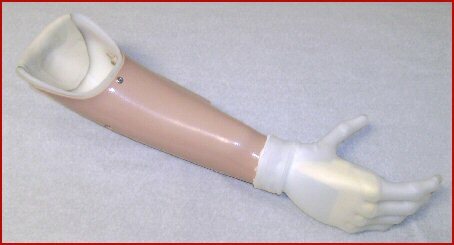 Components for an i-LIMB Hand prosthesis. A high capacity battery located within the prosthesis allows the patient a full day of normal use on a complete charge. Re-charging is a simple plug-in task, and a full re-charge takes 2 to 4 hours. What make's the i-LIMB Hand different than other myo-hands is utilizing the myoelectric principles used in existing devices while taking advantage of the mechanical advance of five fully-articulating powered digits. Whereas previous myoelectric hands could only be opened and closed, the i-LIMB Hand offers numerous different grip patterns. The inclusion of a thumb that can, like the human thumb, be rotated into different positions enables important grip configurations, many of which have not been available to amputees before. The grasp of the hand is much more like that of a human hand with the articulating fingers able to close tightly around objects. Built-in detection tells each individual finger when it has sufficient grip on an object and, therefore, when to stop powering. Individual fingers lock into position until the patient triggers an open signal through a simple muscle flex.